More Info: With a beautifully blended assortment of colors, Acacia hardwood flooring is a tasteful choice that exudes an unmistakable air of sophistication with a rustic twist. Acacia hardwood flooring has a medium to dark brown heartwood tinged with vibrant reddish orange and accented with light yellows. Color: Acacia heartwood is light brown with pinkish tones with similarly colored sapwood. 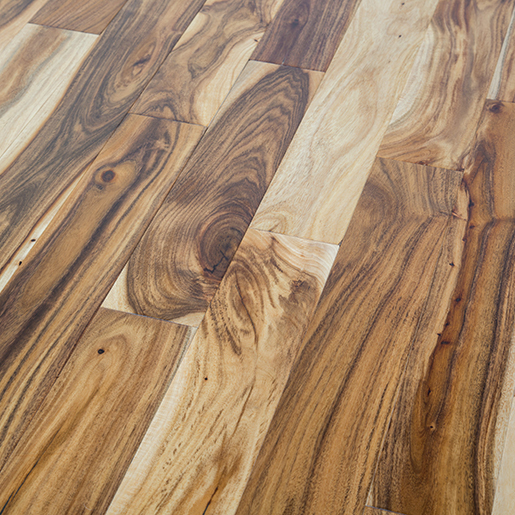 Photosensitivity: Acacia hardwood is photosensitive and will darken slightly over time. Tree Characteristics: The Acacia tree can grow to be 20 to 50 feet hight. Drying Characteristics: Acacia hardwood is quick drying, but experiences cupping and other forms of warping.